Lee Goldberg, the author of more than thirty bestselling novels, introduced his new series featuring acclaimed author and reluctant hero Ian Ludlow in last year's critically acclaimed True Fiction. Now, Ludlow is back in the highly anticipated sequel Killer Thriller, which features the same, clever mix of exhilarating action, rapid-fire dialogue, and the sly subversion of genre tropes that made the debut of this series such a smash hit. Ludlow's bestselling thrillers plunge his larger-than-life action hero, freelance superspy Clint Straker, into a world of explosive international intrigue and action-packed adventure. What Ian's readers don't realize is that the line between fact and fiction has gotten very blurry. A story idea that Ludlow shared with the CIA, in order to help them prepare for terrorist attacks, came true and nearly cost him his life. The CIA wants him on the payroll to help him anticipate threats before they happen, but Ian would much rather tell stories focused on spies instead of becoming one. Ian and his newly hired research assistant, Margo French, fly to Hong Kong to visit the set of a movie being made from one of his books. This is also an opportunity for him to do some research on the studio's dime for his wildest story yet: a global conspiracy by Chinese intelligence to take control of the U.S. economy, media, and government. 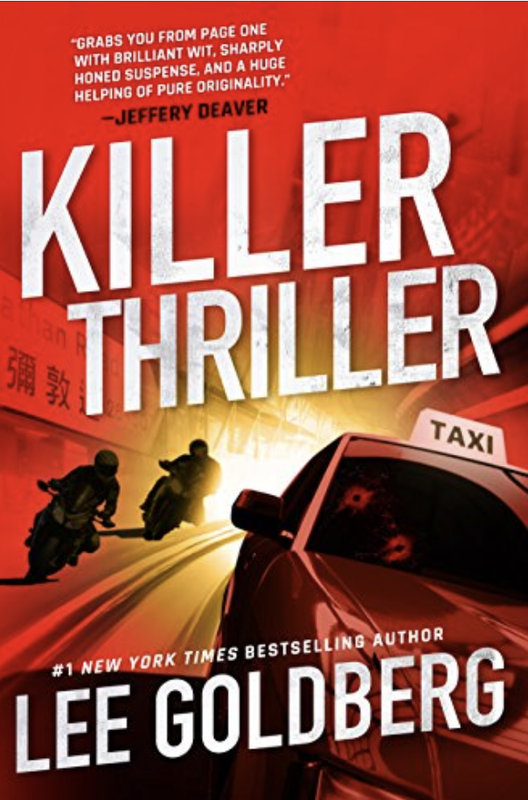 Goldberg writes of when they arrive in China, "the red-and-white Toyota taxi that brought Ian and Margo into Kowloon was one of thousands just like it that clogged the narrow, congested streets. It seemed to Ian that everything in Kowloon was crowded together and fighting for room - the buildings, the cars, the people. Even the airspace above the streets was a battleground, crammed with neon signs that reached out over the roadway from the stores and restaurants on either side. The blazing signs overhead, with their red, orange, and yellow Chinese symbols, lit up the night with a sordid glow that was as bright as day. "Ian rolled down his window to see what the atmosphere was liek outside. The hot, humid air poured in, thick and heavy, reeking of exhaust fumes, fried food, raw fish, and flowery perfume, blaring with the cacophony of car horns, music, and Chinese chatter, and crackling with the friction of all the activity on the teeming streets. It was too much for him. He began rolling up the window but it was a grind, the old gears struggling to push the pane of filthy glass through the sticky air. "She liked it, Ian thought, for the same reason she was able to sleep on the plane and not at home. It was hard to hear your demons when all of your senses were being bombarded. He thought that he might like Hong Kong's energy, too, once he'd conquered his jet lag. When his internal clock was out of whack, everything felt surreal even when he wasn't in a strange new place. "The taxi pulled up outside of the Nine Dragons hotel, a blue-tinted glass tower on the Victoria Harbor waterfront. Susie took Ian and Margo into the lobby, which had a high, vaulted ceiling with a waterfall that spilled smooth and clear down a four-story wall like an undulating sheet of glass. "She led them to a bank of elevators that whisked them up to the thirtieth floor in seconds and then they followed her to Ian's suite. The instant his door opened the lights came on, the stereo system played something bold and orchestral, and the window curtains parted automatically like the opening of a show. And that's exactly what it was. The windows presented a spectacular view across Victoria Harbor to Hong Kong's dense forest of skyscrapers, each one displaying its own elaborate, animated light show. "Ian was so distracted by the dramatic view that he didn't notice anything else about the room until Susie spoke up. "Ian turned and saw his room had a fully stocked wet bar with four stools, a living room with a leather couch, a matching easy chair, a writing desk, and a flat-screen TV. Sliding doors separated the living room from the bedroom, where he could see a king-size bed. He was tempted to finagle a way to stay here for the entire shoot rather than go back to his bleak Oakwood apartment." What Ian doesn't know is that his horrifying scenario is coming to fruition, that the Chinese mistakenly believe he's a spy sent to stop them, and that he is being targeted for death. Ian and Margo find themselves running for their lives and racing the clock to stop a bloodbath in Paris and the collapse of the United States. Killer Thriller is one of the most gripping, entertaining stories you will read. 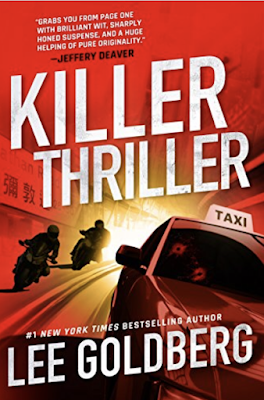 Lee Goldberg will appear at Thrillerfest 2019 at the Grand Hyatt Hotel in New York City from July 10-14,, and details will be available soon. Books: "The Presidents and the Pastime"
Andrea Bartz On Her Debut Novel "The Lost Night"